Crystal Palace ParkThicket Road, London, Crystal Palace, SE19 2GA. It's time to conquer our 2019 Crystal Palace 5k, 10k, 15k and Half Marathon and have a morning out with family, friends, or colleagues and be part of this great event. Take on the ups and downs of Crystal Palace Park. Running around the stunning venue, join us to challenge yourself and meet a load of great people, make new friends and get your Fix Addiction! Every entrant receives full race chip timing, a superb high quality medal to add to your collection, drinks and refreshments on the day and discount offers from us at the Fix as well as from our partners! The 5k is one lap, the 10k is 2, 15k is 3 and half is just over 4 laps. All runners will get split times for each lap. Places are limited so get your entry in asap to be part of a great event and a chance to get out running with friends, work colleagues and the family! Please note you are not required to fundraise for this event. Registration will be open from 8.00am and will close at 9.20am so please arrive nice and early. The event hub is on the grass area up from the park toilets near the lower lake. Please view the race map for more info. Race information will be sent by email pre-event and this will tell you what your race number is so you know where to queue on the day of the event.This can then be printed as your confirmation. If for any reason you don’t receive this email please note this information will be available for viewing online pre-event and you can then search for your name and race number. You will be using our Chip on Bib race numbers and it is important these are displayed on your outer garment to ensure 1) We can see your race number when running and 2) To help with the timing system to read your time. There is carparking in and around the park. Please check on arrival as soon may be pay and display and do your best to arrive with plenty of time to spare as parking may fill up quickly. Situated at the top of Crystal Palace Park and there are also toilets which will be situated near the event hub. 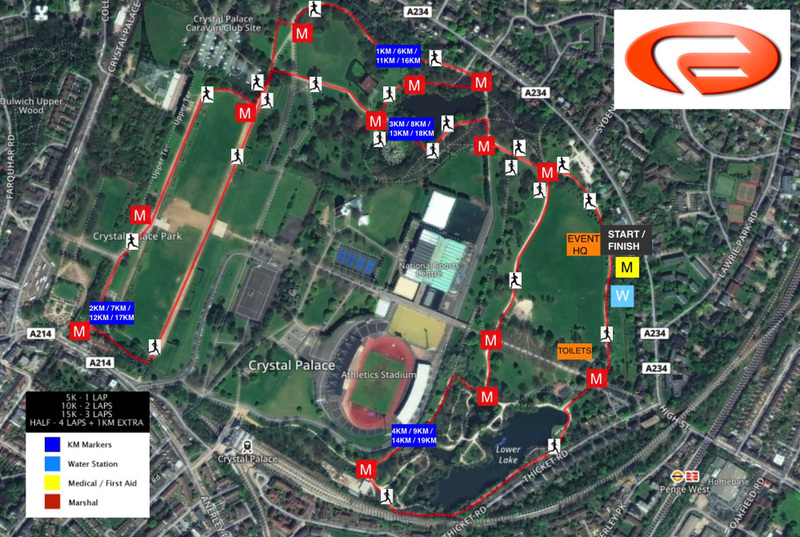 The runs will kick off at 9.30am and will take you around Crystal Palace Park. We will start gathering you in to the start area at 9.20am. We will have some funky tunes played to get you ready for the challenge that awaits! Everyone will receive a medal and there are also a few trophies that are up for grabs! You will be able to check out your instant race results. We look forward to seeing you at our events. Results will go live on our website immediately after the event. If you have any questions regarding the runs, please do not hesitate to contact us. Get ready to Conquer the Palace! See you there. There is parking in and around the park so please check and ensure you arrive with plenty of time to spare. From the main carpark in the centre of the park head down to the lower section of the park near the Lower Lake and at the entry from High St/Thicket Road and the event hub is on the grass area up from the park toilets. Trains travel frequently to Crystal Palace and the park is only a few minutes walk from the train station. Entries close on the 4th September, 2019. Event prices exclude 10% booking fee. Thicket Road, London, Crystal Palace, SE19 2GA.